My EQView feature this week was on a new production of The Importance of Being Earnest, playing at the Harold Pinter Theatre, with a distinguished cast of very well established and well known stars. The Importance of Being Earnest is one of Oscar Wilde’s most famous, well loved and popular plays. It is a very clever satire on Victorian society and values, and contains some of the most memorable and witty one-liners ever written in the English language. This production of The Importance of Being Earnest is an absolute joy and a real delight because it gives a much loved classic a fresh twist. Highly recommended! 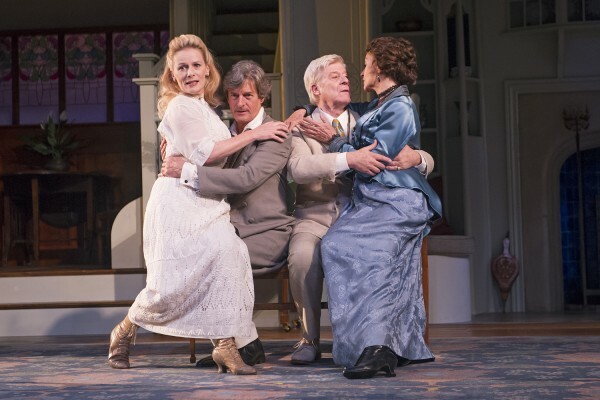 A new production of The Importance of Being Earnest is playing in London’s West End, at the Harold Pinter Theatre, with a distinguished cast of very well established and well known stars including Martin Jarvis and Nigel Havers. The Importance of Being Earnest, A Trivial Comedy for Serious People, is one of Oscar Wilde’s most famous, well loved and popular plays. It is a very clever satire on Victorian society and values, and contains some of the most memorable and witty one-liners ever written in the English language. Such is the popularity of the play that, at any given time, like many of Shakespeare’s plays, there is likely to be a production, whether professional or amateur, playing in a British theatre. Familiarity can breed contempt and if you are staging The Importance of Being Earnest, especially in the West End, you need to do something different with it, or bring a new angle to it, to enable your audience to come to it fresh. This production definitely delivers on that score! Martin Jarvis (aged 73) plays John Worthing and Nigel Havers (aged 62) plays Algernon Moncrieff. In the play, Worthing and Moncrieff are young gentlemen about town in their 20s. Jarvis and Havers originally played these roles in Sir Peter Hall’s production of The Importance of Being Earnest at the National Theatre in 1982, when their real ages closely matched those of their characters. The fact the actors are now significantly older than the parts they are playing is explained away because we are watching an amateur company’s – “The Bunbury Company of Players” no less! – final dress rehearsal before they put on their much loved production of The Importance of Being Earnest. This means we are watching a play within a play. This adds new material to the play, new characters, new storylines, new humour, and makes the material fresh to an audience who may be very familiar with the classic play. The play within a play device is used mainly in the first half where it really does add extra humour to the play as we have plates of cucumber sandwiches magically appearing and disappearing, props going missing, sound effects coming in the wrong place at the wrong time, costumes in need of urgent repair, and the myriad of other things that usually go wrong in an amateur production. The play within a play also provides us with new characters, and new interlocking relationships to understand and watch. This includes a leading man who has an affair with a different woman every time they stage a production; a husband, roped in at the last minute, making his stage debut; and a professional actress who finds the world of amateur theatre is not quite what she is used to. I found that giving a very familiar play this extra layer of complexity really added to my enjoyment of, and engagement with, the play, because it kept me on my toes as there was new material, new characters, and new comedy to digest. But this extra covering does not take anything away from Wilde’s original play. This is still played out in full and, as the play goes on, the backstage antics are cut to a minimum, and we focus on the original play. I studied this play at school, am very familiar with the text, and have seen various productions of the play over the years. However, for some people this was their first experience of the play. When Worthing’s origins, life history and true identity are revealed towards the end, there were audible gasps of astonishment from the audience. I think this production would be equally appealing to, and appreciated by, audience members very familiar with the play and those coming to it for the first time. All the actors were excellent but I would like to single out two in particular. Nigel Havers brought a real joy and energy to his roles and genuinely seemed to relish playing to the gallery – I particularly appreciated his unsubtle stage winks! Siân Phillips’s Lady Bracknell was spot on – all Lady Bracknell should be and so much more! One final tip. If you go and see the play it is well worth investing in the programme, which is very informative and a lot of fun. The real programme contains in-depth commentary about Wilde, the play, and this production. The programme also contains an insert – The Bunbury Company of Players’s programme for their production of The Importance of Being Earnest. This mock programme was a lot of fun and brought a smile to my face. In summary, this production of The Importance of Being Earnest is an absolute joy and a real delight because it gives a well known and much loved classic a fresh twist. The play is presented in a new and engaging way, equally pleasing to theatregoers very familiar with the play and those experiencing it for the first time. Catch it whilst you can! The Importance of Being Earnest plays at the Harold Pinter Theatre in London until Saturday 20 September, after which it embarks on a UK tour visiting Theatre Royal Bath, Theatre Royal Brighton, Aylesbury Waterside, Richmond Theatre, and Alexandra Theatre Birmingham.